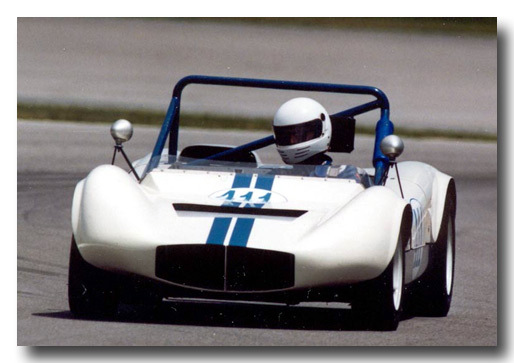 Our car was one of about 40 H-Modified class racecars designed and built by Don Miller (no relation to the Indy Miller cars) in California during the late 50s and early to mid-1960s. 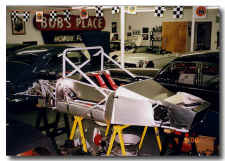 All were different, built to various specs and often owner finished. 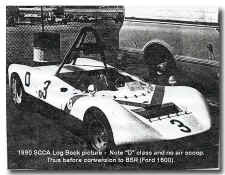 Our car was probably one of the last cars he built (more on this subject later). 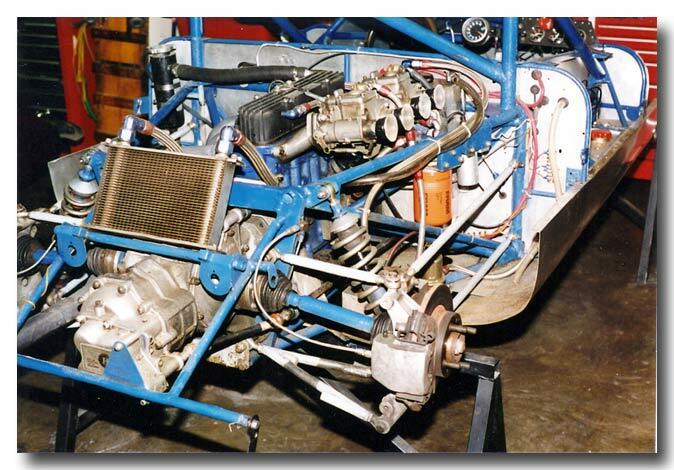 The car's drive train has been modified from the original H-Mod powerplant, probably a Crosley 850cc engine. 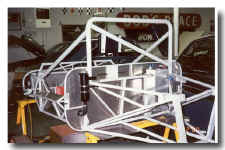 Who/when it was converted to its current engine/transaxle configuration is unknown. This was done by whoever owned and raced it in California. 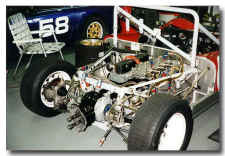 The conversion was done prior to 1999 (when we purchased the car), but after 1990 (as proven by the 1990 SCCA Logbook picture at right which shows the car in its original power train configuration). 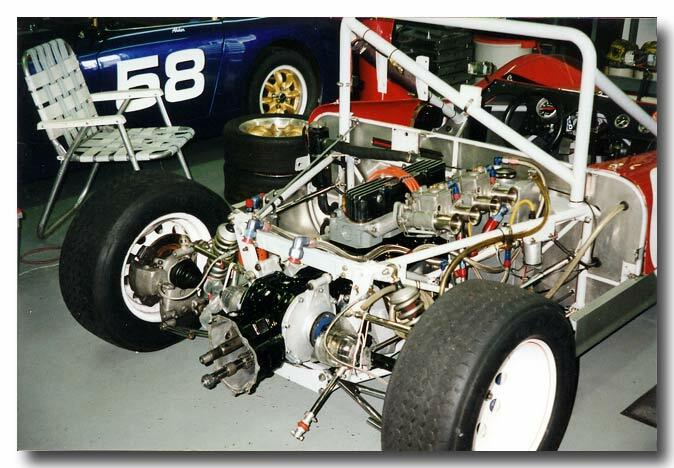 So, after 1990 it was converted it to its current four cylinder 1600cc Ford pushrod motor and the Hewland transaxle. This is the same basic engine as used in Formula Ford spec series. 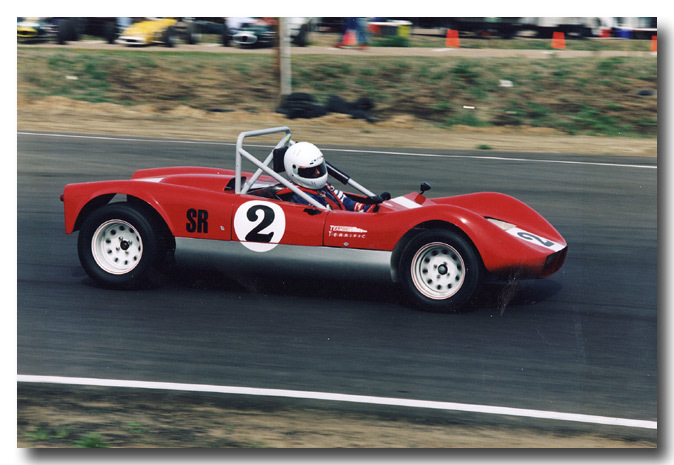 However the current engine is fitted with dual 40 DCOE Weber carburetors and a mild cam shaft, thus creating about 10 more horsepower than the spec FF engine. 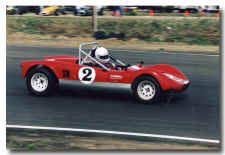 The transmission is the Hewland MK-8 four-speed transaxle. The car is capable of about 125+ mph top speed. 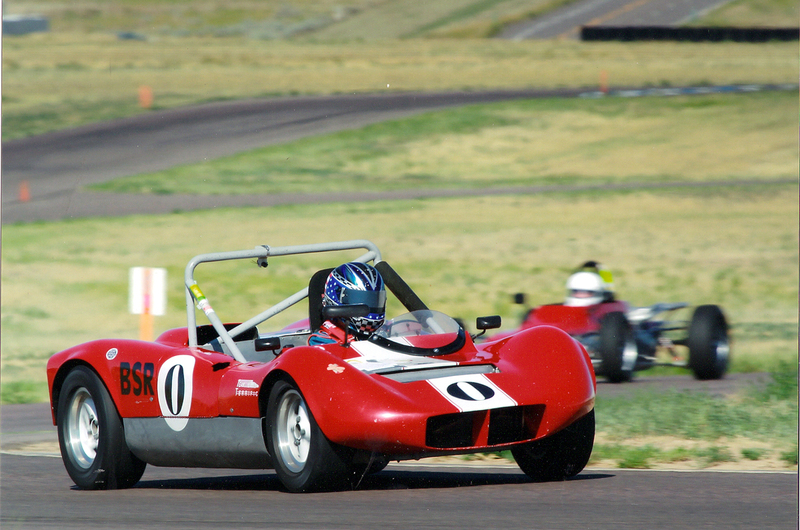 The car is raced regularly by Diane Alder at Rocky Mountain Vintage Racing events as well as with other vintage club events around the country. In February of 2004 the car participated in the fantastic annual four-event Southern Festival of Speed races in New Zealand. Follow this link for a ton of, if not exhaustive, information on that one-in-a-lifetime adventure. 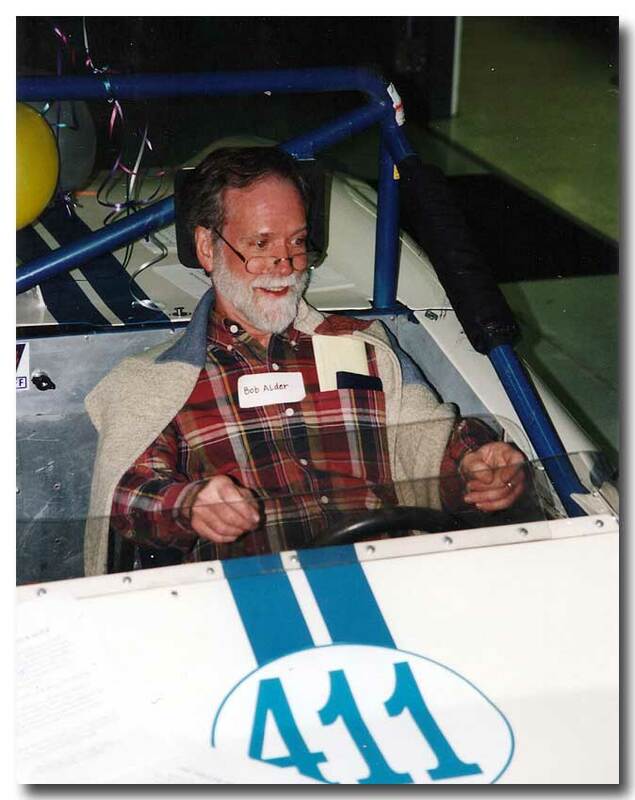 In the the spring of 1999 the car was donated by it's prior owner, Terry Hefty, to a fund raiser for one of RMVR's members who was battling cancer. I was fortunate to be the winning bidder. At the time Diane had not yet started racing. But during the evening the cute Miller, aided by a few glasses of wine and urging from other lady drivers, caused her to say, "I think I'd like to start racing now." 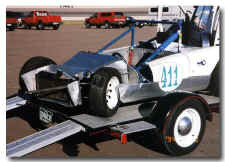 The RMVR Spring Driver's School was in two weeks. She was there and the rest is history. Below are the happy new owners of the car that fateful evening when we purchased the car. 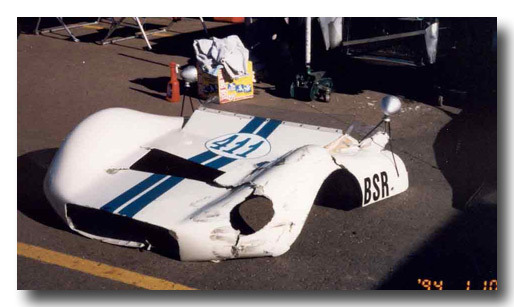 At then end of our first season with the car, it was involved in a hard shunt (Diane wasn't hurt). The car was thus completely restored in the winter of 1999/2000. The following are some before and after photos. The left front was damaged significantly necessitating completely stripping the car down to the bare frame for proper repairs. But the results were worth it! 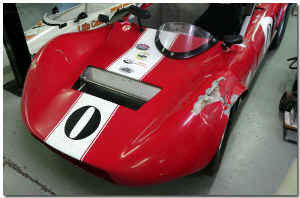 In addition to the damage repairs, the cosmetics and a lot of small improvements were made. 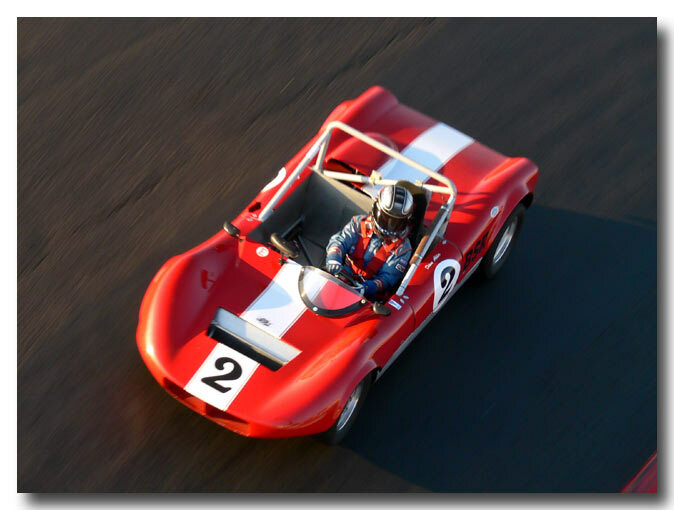 In its many years since that restoration, it's been a reliable workhorse of a race car. Click on any image to enlarge. 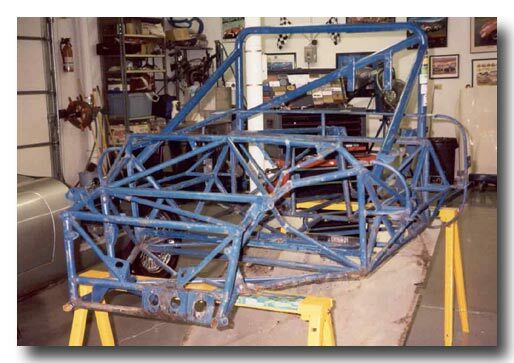 The above three pictures on the left show how badly the car was damaged in 1998. 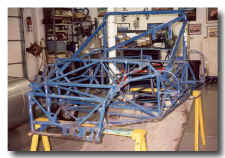 The left front fender was basically torn off of the front body work. More disastrously, the left front corner of the frame was badly caved in as you can see in the middle two pics (on trailer at the track and in the shop after being stripped down to bare frame). 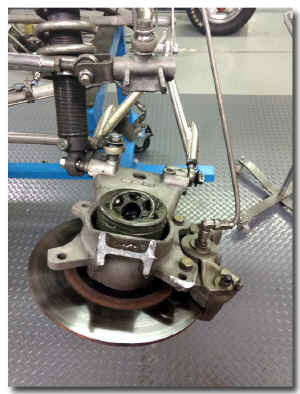 The picture on the right simply shows how the engine compartment looked before the restoration. No damage there - just needed cosmetics. At left, the frame was completely and magnificently repaired by J.D. 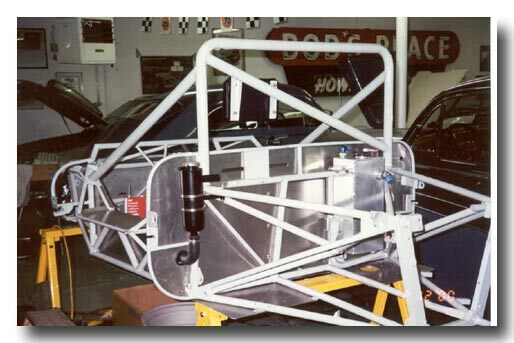 McDermott's Front Range Motorsports and painted in a proper frame gray. After that the process of pop-riveting all new aluminum panels began (middle pictures) Then after most of the new panels had been installed, the engine/transaxle was re-fitted (picture on far right). The fiberglass repair to the nose was done by Vic Cooper, an absolute magician when it comes to composite materials as the finished car (below) clearly shows. 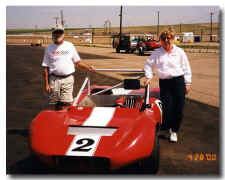 Racing at High Plains Raceway in 2012. 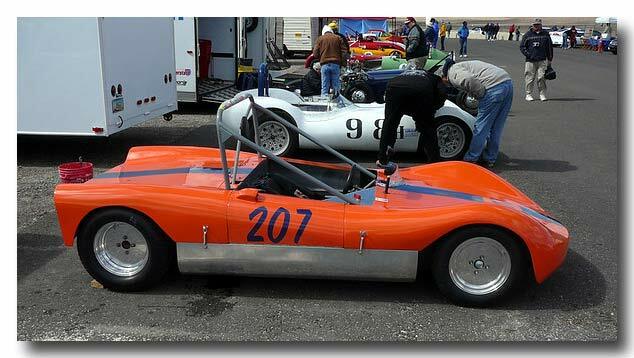 Sadly, Diane's beloved Miller had a freak "incident" at our Race Against Kids' Cancer in August of 2018. 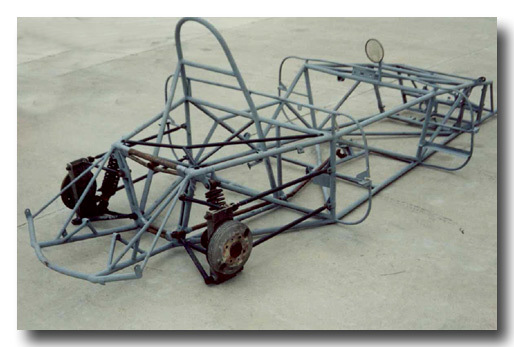 You ain't gonna' believe this; it got rolled being towed back to the pits. Long sad story. 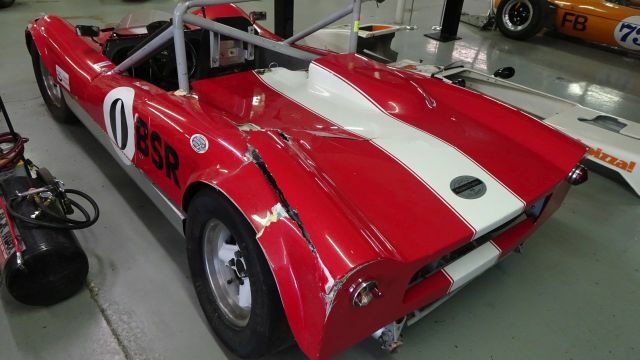 Knackered it pretty good, all body work and frame were damaged. Diane was unhurt because she remained fully belted up in the car! Watch the video carefully in the upper right hand corner. Video was taken by the track's video system. It was decided to simply do another full ground up on the car. 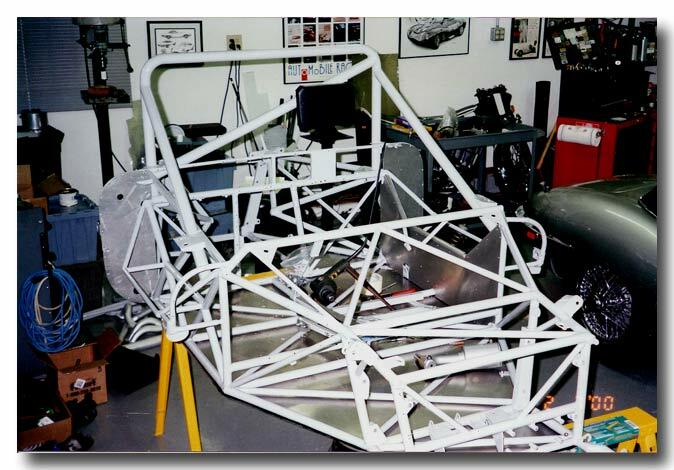 A full restoration was done back in 2000, but that was 18 years ago now (Can't believe it!). 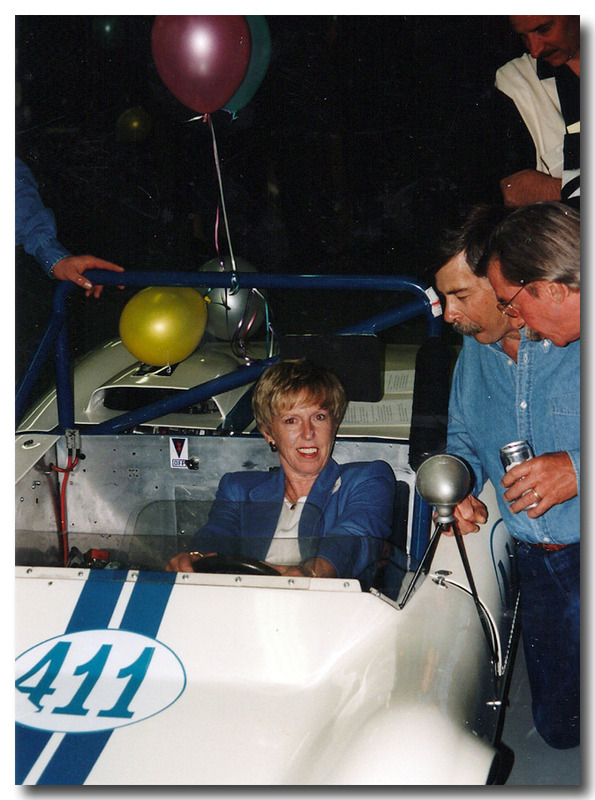 Since then Diane has done 100 plus race weekends on the car! So rather than just patch up the damage, it will be taken down to the bare frame to refresh everything. Can't stand seeing it sit there all messed up. Plus, she loves the car!. What a mess. 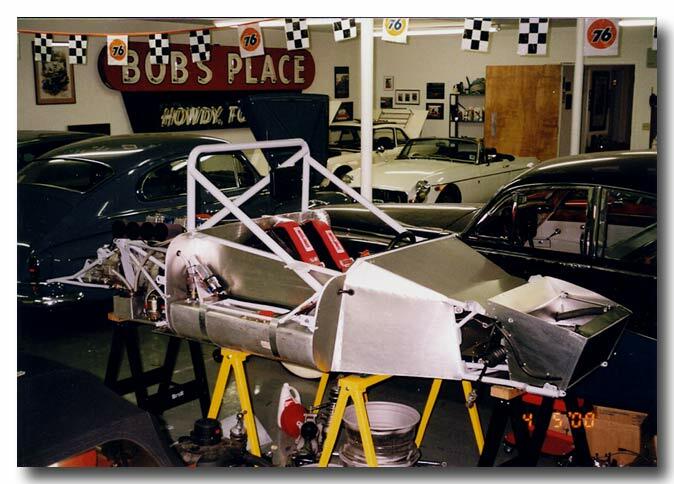 Both front and rear fiberglass body work were significantly "deranged." Arrows point to the really serious damage. 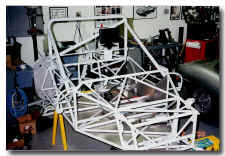 Roll bar pushed down into frame about 1/2". 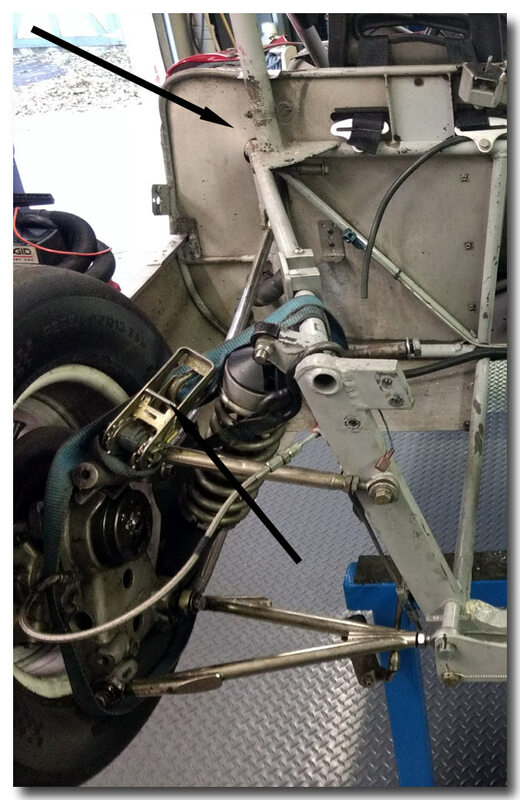 Rear upright broken (here being held together with a ratchet strap). At right, shows left rear broken upright, bent shock and bent trailing arms. To follow the saga of the 2018-2019 restoration, visit the gallery on our SmugMug site with pictures of the restoration. It is essential to bring the car back.